How do I filter the Calendar view by course as a student? By default, the Calendar displays your personal calendar and course calendars for each class in which you are enrolled. However, you can filter which calendars display, including group and course calendars as well as your personal calendar. After clicking the Calendar link, you will see the Calendar for all your enrolled courses and groups. 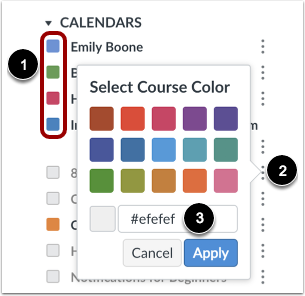 In order to filter your Calendar by courses or groups, click the color box next to the Calendar . The calendar can show up to 10 courses and/or groups at a time. In this example, not all of the calendars are being shown. 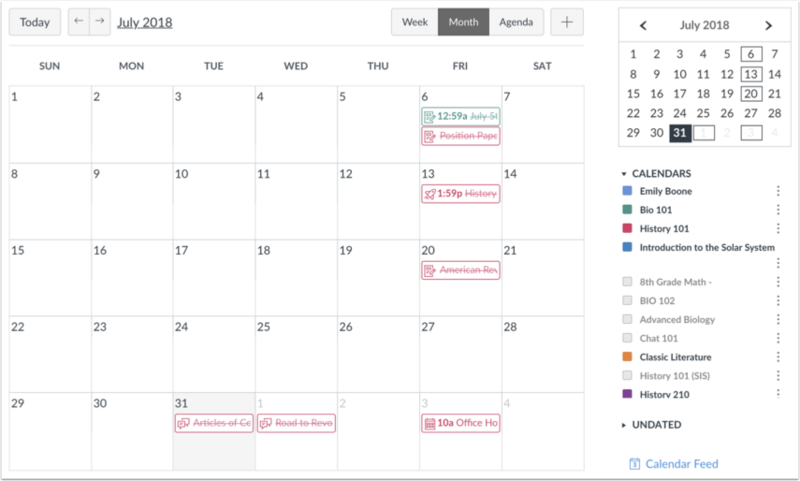 Note: Canvas will assign an arbitrary color for each calendar unless a custom color is chosen. Each calendar contains 15 default colors, but you can create any color of your choice by selecting the More icon  and inserting a Hex code . Previous Topic:How do I use the Calendar as a student? Next Topic:How do I view the Calendar iCal feed to subscribe to an external calendar as a student? Table of Contents > Calendar > How do I filter the Calendar view by course as a student? Re: How do I fix my Calendar? Re: How can I delete a class from my calendar?